Last month in a post on “Video is now a ‘must have’ in Higher Education – but what are the implications for accessibility?” I cited a State of Video in Education 2014 report which described how “video has a significantly positive impact on all aspects of the student lifecycle, from attracting and retaining students to enhancing learning, boosting learning outcomes and building stronger alumni relations“. In addition to its value in supporting student learning and recruitment video can now be used to provide professional development opportunities for academics and researchers. As described in a Jisc guide on Using videoconferencing and collaboration technology to reduce travel and carbon emissions “the right technology can be a usable alternative to physical travel benefitting administrative, academic and research purposes“. The Webinar definition provided by Webopedia explains “Short for Web-based seminar, it is a presentation, lecture, workshop or seminar that is transmitted over the Web using video conferencing software”. The article does not mention that the term ‘webinar’ is not popular in many circles as it feels somewhat contrived. However the use of networked technologies to enhance presentations, lectures, workshops and seminars should be appreciated by academics and researchers, especially those who are comfortable in making use of IT. The EU-funded LACE project (Learning Analytics Community Exchange) is bringing together key European players in the field of learning analytics (LA) and educational data mining (EDM) in order to support the development of communities of practice and share emerging best practice. The LACE project will be providing a number of face-to-face events including a half-day workshop session on Developing a Learning Analytics Strategy for a HEI at the CETIS 2014 conference.Such face-to-face events will be complemented by a webinar series which will be launched next week, on Tuesday 13 May 2014 starting at 13.00 BST. 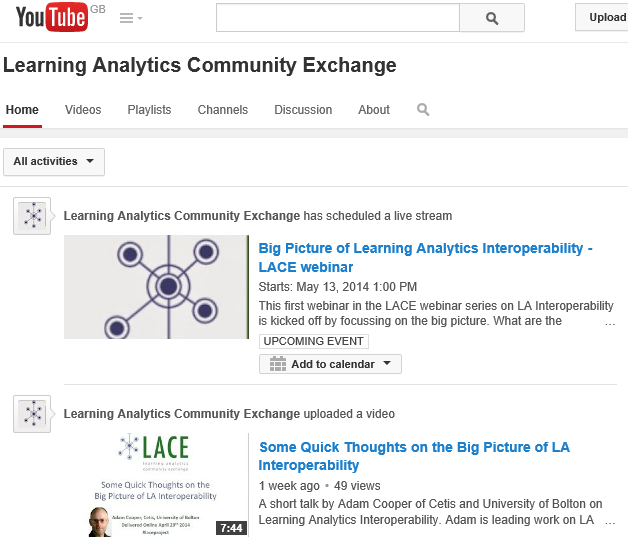 If you are new to learning analytics interoperability a video recording of a short talk given by Adam Cooper, Cetis is available on the LACE YouTube channel. The LACE Webinar will make use of Google Hangouts on Air which provides live streaming, storage of recordings on YouTube and management of audience interactions. We welcome feedback on the technical environment we’ll be using as well as non-technical aspects of use of this technology. If you’ve used Google Hangouts on Air previously, has the experience been useful or have you encountered difficulties? If you have not used Google Hangouts on Air what are the reasons for this? If may be that there have been no events of relevance to you, but if there are other barriers I’d like to hear about them. Feedback can be provided as comments to this post. Alternatively feel free to use the online survey.